Music Band Music introduced as "Forty-eight states... 48 stars... 48 men marching down the Main Street of everybody's hometown! Here comes the Cities Service Band of America, conducted by Paul Lavalle!" "Karl King Emblem of Freedom"
"The Cities Service Band Of America", originally "Cities Service Concerts" from 1925 through 1956.
the Main Street of everybody's hometown! In 1910 Henry Latham Doherty started the Cities Service Company to supply gas and electricity to small public utilities. Cities Service Company began acquiring gas producing facilities throughout the mid-continent and southwest, and began pioneering pipeline and distribution systems. Doherty developed a system of refilling depleted oil fields near market areas with natural gas during the low demand summer periods so that cheap gas would be available during peak demand times. At the height of the company's growth the Public Utility Holding Company Act of 1935 forced the company to abandon either its utility operations or its gas and oil operations; the difficult choice was made to remain with petroleum. The Cities Services Concerts began with trial broadcasts in New York in 1925-26, featuring the Edwin Franko Goldman Brass Band. On February 19, 1927, the show expanded to an hour-long and expanded to a symphonic sound with a 30-piece orchestra and the Cavaliers Quartet. The title was changed to Highways of Melody in 1944, and again in 1948 to The Cities Service Band of America when Paul Lavalle was chosen as the orchestra leader. A 1940 New York Times article described Lavalle as being "of small size, dynamic, dark haired ubiquitous music maker" Lavalle told the journalist "Music is my life, and I am happy that it is so." The series would finally come to an end on Jan 16, 1956. 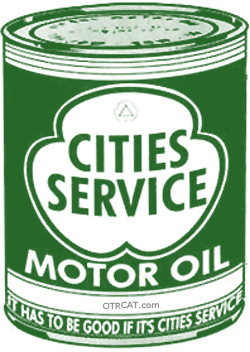 Cities Service Company would become the CITGO Petroleum Corporation. The collection also contains a rare collection of Cities Service Band of America recordings from WRCA in New York from 1953 and 1954. This collection also contains and additional 13 marches from other sources. powerful heart pounding music band music..."
I just want to say how much I continue to enjoy your service, having just ordered your Cities Service Band of America, Benny Goodman and WII Swing broadcast recordings. When I was a child I was very ill with polio and had to stay in bed, or at least in my room, for many weeks. I had a little desktop radio and spent many evenings listening to favorite programs, at the top of which was the Cities Service Band of America one. For a birthday I was given a Benny Goodman collection and the rest was history, as they say. In high school I played the trombone in our concert band and then put together my own big band (sorry no broadcasts remain :-) ). I've collected about every Goodman recording I can find and for years searched for band of America recordings to replace beat up old 45s and one lp, the classic Lavalle at Work . I college I did a radio show on big bands, back to back with Herbie Hancock, and I remember our station getting lp's of live broadcasts from Armed Services Radio. I wish I had kept those, but suspect you are close. Anyhow, I'm sure you get lots of notes like this, but I did want to say something very appreciative about what you are doing. I received discs today. I must thank you for the immense pleasure these radio programmes are giving my husband. He listens mainly for the wonderful music that he used to hear in his younger days.He really appreciates being able to buy them from you. The Cities Service "Band of America" Directed by Paul Lavalle was a wonderful series of many Band music programs. There's been nothing like it, before or since. I would think the series would be available somewhere. I would love to have the entire series, and "would stand in line" to get it!!! Sometime ago I wrote to you about the series /The Cities Service Band of America, Directed by Paul Lavalle. I believe NBC carried it in the late '40s into the early '50s I am a band director and "cut my teeth" on the fine literature performed by this wonderful organization. There hasn't been anything to compare before or since. Your having the series available would be great service to Bands throughout the country, and the World , for that matter. Are there any downloadable songs or CDs of Paul Lavalle and the Cities Service Band of America available? I am in Durban, South Africa and used to listen to the broadcasts on Long Island 1953 to 56 and went to one of their concerts in NYC as a grade school boy. Oh yeah, most interested in the Citiy Service shows. I'd really appreciate them. I also really enjoyed the D-day album. I think there is also another network compilatione, and it may be a complete 24 hour pass on NBC like your CBS one which I really like. Very representitive of the music of that time also (Big band stuff). But the stirring performances of the patriotic stuff is great!!! Thanks so much for finding this and making it available. I'd still love to find the 33 1/3 albums "Concert in the Park" and "Great Band Music." I will also be delighted with any other broadcasts. I remember these arrangements well. As a trombonist, I especially appreciated the trombone solo. Since I am now in South Africa, I particularly appreciate being able to download the broadcast. The discs arrived today. I just want to tell you how much I am enjoying the Cities Service Band of America one. I have been searching for years for recordings (I wore my records out 40 years ago) and only came up with one, the fabulous Lavalle at Work, which I've digitized. When I was a child I was very ill and missed almost two years of school. A highlight of my week was the Cities Service program. It encouraged me to take up the trombone and I later became active in concert and jazz bands. Paul Lavalle was a real hero to me. So, thanks for pulling that together. The sound is better than my old table radio's and the spirit of this kind of Americana is hard to beat. I'm sure I'll enjoy the other recordings, but did want to mention this one to you. Best wishes. You have a great service. I will doubtless be ordering more. After years of searching I finally found Cities Service Band of America broadcasts on you web site. I ordered the one disc you have. Listened for the first time today on a trip of my Cities Service Band of America MP3. Brought back memories of when I listened to them on the radio way back in 1949-50. 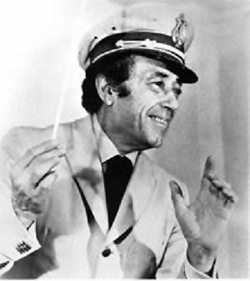 I have just been reading a biography of American band-music composer and conductor Henry Fillmore, and noted, with interest, that he guest-conducted on the Cities Service Band of America Radio Show on three occasions, on at least one of which Maestro LaValle was absent. Noting that you offer an MP3 disc of that programme, and that Dr. Fillmore's name is mentioned once. If I recall correctly, the show in which I am interested aired in 1951, and featured the then-future Dr. Fillmore conducting his own music and that of others, including Sousa. He concluded with two marches of his own, one of these being the ever-popular "Americans We." If the listed dates in March reflect broadcast dates, then it is probably not there since the episode in which I am interested aired in July, again if I recall correctly. A rechecking shows that the date was, in fact, 5 August, 1951. Since Fillmore made only one commercial recording, over 20 years before this appearance, recordings of him conducting must be _EXTREMELY_-rare, thus my hope that this one is indeed available! Since the total cost for this item is quite-low, I had to go with it. I think it highly-likely that "The Clapton" is a misprint or some such, and that the actual title of the march you cite is "The Claxon," though I would need to re-check Dr. Bierley's book to find out if Fillmore indeed wrote one called "The Clapton." For what it is worth, three other marches, not by Fillmore but conducted by him in that broadcast in which I am interested, are "Purple Pageant," which opens that programme, Semper Fidelis" and "The Florentiner." None of these are mentioned in the abstract for this disc on your Website. It is good that you accept both credit cards and PayPal since, for the time being at least, this blind person is unable to use the latter due to me not yet having updated my browser, the updating of which would make it advisable for me to purchase a new, quite-expensive, screen reader to replace the one I mostly now use, though I do understand there to be two other, less-expensive, alternatives. Yet, since my card is also directly-linked to my bank account, the inconvenience would only be a matter of a little extra time. With _MANY_ renewed thanks and best wishes I remain Gratefully, respectfully and sincerely. I believe (according to an old newspaper) on that broadcast was a performance of the Official Little League March written by Solita Palmer. After the broadcast, Ms. Palmer presented a silver stirrup to Mr. LaValle for his work on behalf of Little League (info from the Wilton Bulletin, Wilton, CN – Aug 27, 52 page 4) At some point in the very early 1950’s lyrics were added to the song by Emerson Yorke. I would hope that the performance had the words as well. I am trying to track down a complete recording or performance of the song. I have portions of the song as background music in several little league documentaries from 1949-1952. I am looking for a PARTICULAR March as played by Paul Lavalle and the Cities Service Band of America. I know you have the MP 3 Disc available that has ALL those radio programs on the one disc. I am an old codger who is not adept AT ALL in the CD/ MP3 "lingo" OR "knowledge" world. How do I find that particular March entitled , "Under the Double Eagle"?? I KNOW THAT "it" IS somewhere WITHIN those 7 hours of Music contained on the Disc.